American home and residential property owners are increasingly taking out loans to have a solar photovoltaic (PV) energy system installed as opposed to turning to third-party owners (TPO) providing residential solar leases or power purchase agreements (PPA). The number, and types, of solar loan financing providers is on the rise in parallel, as is the variety of financing options available. The largest, market-leading TPO (third-party owned) residential solar leasing-installation companies, such as SolarCity, Sunrun and Vivint, are shifting away from solar leases and PPAs and expanding their solar loan programs as the federal solar investment tax credit (ITC) is being reduced on its way to expiration. So are more locally focused solar installation companies, who are taking advantage of a growing variety of online, third-party residential solar lending software packages and platforms in bids to enhance and expand their products, services and businesses. The big difference between solar loans on one hand and solar leases or PPA's (Power Purchase agreements) on the other is that with a solar loan you as the homeowner own the panels but leases and PPA agreements are what is known as third-party ownership models where the solar company retains ownership of the solar panels and charges you for the power. Initially, when solar was very expensive and there were few loan products available leases and PPA’s were popular but now that solar is so much cheaper, and there are more loan products available, most people prefer to own their solar panels outright and pay off a normal loan. The cost of solar PV panels – the heart and soul of any residential solar PV system – continues to decline. The run of year-over-year and quarter-to-quarter declines may come to an end, however. Whether or not they do hinges on the severity of the additional import duties the Trump administration decides to impose on Chinese-manufactured PV cells and modules in light of the U.S. International Trade Commission's recommendation that additional remedies be imposed as a result of unfair trade practices. That said, the cost of installing a residential solar PV system is as cheap or cheaper than it has ever been. The so-called "balance of system," or "soft costs," that account for the large bulk of overall residential solar PV system project costs are declining as government authorities and industry participants work to reduce the finance, legal and administrative "red tape" associated with the installation of residential solar PV systems. 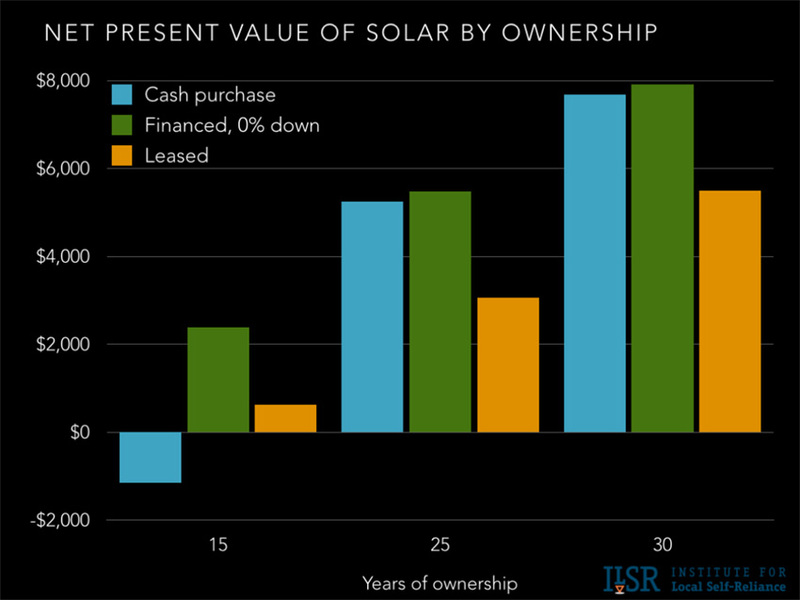 In contrast to financing a residential solar energy system via a lease or PPA, homeowners that choose to do so via loans wind up owning the system. As with leases, they'll repay loans over specified periods of time, or terms, with interest charges accumulating at specified annual percentage rates. In addition to choosing a solar installation company, homeowners that obtain solar loans directly from banks may want to include, and arrange for the same, or perhaps a different, solar company to monitor and service their PV system over time. Those services, as well as performance guarantees, are typically included in residential solar loan and services packages offered by high-quality, full-service residential solar installers. The cost, and terms and conditions, of residential solar loans can vary widely across the U.S., however. Generally speaking, they should be cheaper and easier to source in states in which government leaders and regulators have instituted and continue to support robust solar energy incentives, such as California, Hawaii, Massachusetts, New Jersey and more recently, North Carolina. Solar Review's Solar Estimate pricing engine reveals that cash purchase of a residential solar PV system in North Carolina cost an average $2.94 per watt, exclusive of the 30% federal solar ITC, as of December 2017. All other things being equal, that rises to $3.41 when financed with a loan, which makes for an average payback period of 6.8 years and an estimated average savings of $28,900 over a 15-year useful life. In comparison, it cost an average $3.18 per watt to cash purchase and have a residential solar PV system installed in California as of last December. That rises to $3.56 per watt, before the 30% solar ITC, if financed with a loan. Both the estimated average payback period and average lifetime savings come in the same in California as they do in North Carolina, at an estimated 6.8 years and $28,900, respectively. Market-leading TPO solar lease and PPA providers SolarCity, Sunrun and Vivint also offer residential solar loans across a growing number of U.S. states through networks of qualified local installation companies. Terms and conditions may vary, but generally speaking they are designed to offer little or zero in the way of upfront costs; attractive, low annual interest rates, performance guarantees, and optional or mandatory post-installation monitoring and/or full-service operations and maintenance agreements. Offering solar installation companies and their customers an alternative to bank financing, Spruce Finance in September 2016 added residential solar loans to the residential solar lease and solar PPA options already available on its SpruceFlow online platform. Earlier, in May 2016, New Jersey-based NRG Energy's NRG Home Solar unit announced new, residential solar energy finance and customer relationship management partnerships with both Spruce Finance and Sunrun. Ranked No. 1 in Solar Review's 2018 review of the Top 100 American Residential Solar Installers, Blue Raven Solar, Utah offers residential solar sales, financing and installation in eight U.S. states. Blue Raven touts two home solar financial products – BluePower and BluePowerPlus+ – that it says combine the best attributes of solar loans, leases and PPAs to finance solar ownership at zero upfront cost and with guaranteed monthly energy bill savings. First Green Bank's residential solar loan program carries a 6.02% APR, a 20-year term and yields instant savings, according to the bank. Those interested can use First Green's Residential Solar Energy Savings Calculator to come up with a good estimate of the costs associated with financing a residential solar PV system installation with a loan. The estimated costs of installing a 16-kW solar PV system that should meet all of the electricity needs of a 2,000 square-foot home with a monthly electricity bill of $300 should cost somewhere around $34,000, according to First Green's Residential Solar Energy Savings Calculator. That drops by $10,200, courtesy of the federal solar ITC. As the hypothetical homeowner is now generating all the electricity he, she or they need, they reduce their average, $300 utility bill to zero. They would need to pay First Green Bank an average monthly loan repayment of around $244, but the net result is a monthly savings of around $56. The Minneapolis-based Institute of Local Self-Reliance (ILSR) has developed an Ultimate Solar Calculator app that requires a bit more input, but should yield more accurate results. Furthermore, you can copy the app's software code and paste it into a website, or download and run it on your smartphone or other handheld telecomputing device. What is the Solar-Estimate pick of the best and cheapest solar loans currently available in 2018? ****Note that all the information in the table above is typical but may vary. You should be aware that dealer fees are charged by the loan provider to the solar company but these are usually absorbed by the solar company and included in the price they charge you for solar. How do you find the best solar loan offers available in your city? The solar installation companies that service your city will have one or a number of solar loan packages that they resell and they will include these terms in the quotes they give you. With solar loans consumers don’t usually approach the financier directly they are usually sold through the solar company you choose to do your installation. You can enter your details (address and power use) into the Solar-Estimate online solar lending calculator here and it will give you an online estimate of the size of system you need and the likely repayments, it will also request solar loan terms from between 1 and 4 solar companies that service your area (your choice as to how many offers you want to see). Expect the rising trend of residential solar lending to continue as banks, investment companies, financial technology specialists and solar energy installation companies become more familiar and gain confidence with each other and the long-term value of investing in residential solar loans. In September, for example, Mosaic and leading U.S. banking-financial services group Goldman Sachs inked a deal via which the former agreed to sell and the latter purchase $300 million of rooftop solar loans. Investing in residential solar loans will produce attractive, steady and comparatively secure returns for Goldman, as well as opportunities to package them into debt securities and sell them on to clients. For Mosaic, the deal provides a $300 million capital infusion that it can use to extend new residential solar loans. Developer of a pioneering, residential solar energy project crowdfunding platform, Mosaic numbers among the few, but growing, number of residential solar finance and financial services providers that offer solar loans to other residential solar installation/project developers. Including the $300 million Mosaic garners from selling a package of its residential solar loans to Goldman Sachs, Mosaic has amassed $800 million in capital from banks and credit unions, as well as another $650 million in borrowing capacity from financial partners.